The preference center can be accessed through its own URL. 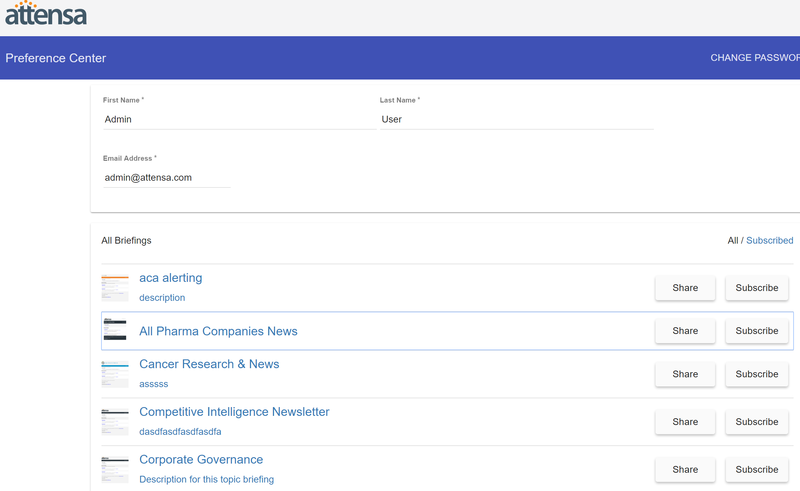 You can use iframe to add the briefing subscription page to a portal for example. Once you logged into the preference center for your tenant you will see a list of available briefings (Note: Briefings need to be published to be visible in the preference center). You can browse the briefing list and preview the briefing by selecting it. Select subscribe/unsubscribe to invoke the appropriate function. As a user you can share the briefing with a colleague by selecting the "Share" button. For more details watch this video clip.